The game has no title screen, so the closest we get is the "version" command. Everything from the original is here: a no-name hero whose only attributes are strength, armor class, and hit points; a large and varied selection of equipment; potions of various colors, wands of various metals, and scrolls of various arcane names, with their effects randomized for each new game; monsters that you can fight with missile or melee weapons or with the intelligent use of items; and of course the constant need for food, the inability to backtrack, and permadeath. Even the messages that appear when you use unidentified items are copied from the original. A Potion of Restore Strength--with the same message that Rogue gave you. The only major changes are unwelcome ones. First, each dungeon level requires multiple screens instead of fitting neatly on a single screen. This makes it more difficult to identify "obvious" secret areas. (This is a limitation of the Atari 800 hardware, I suspect, and not something we should necessarily blame the programmer for.) Second, the color scheme changes randomly with every level, with some of the options a bit dark. The Atari 800 had no arrow keys nor keypad, so I understand the need to make an uncomfortable choice, but holy moly. It's like he was so set on using various other keys for their original Rogue functions, like (I)nventory and (E)at, that he just fit movement--the most important part of the game--in wherever he could. Even then, he could have used TYU/GHJ/BNM without having to change any other commands. Aside from the icons, there are minor graphical improvements. You see arrows fly to their targets, for instance. But sounds are just beeps and are best turned off. In a room occupied by a jackal and a pile of gold, I find a shortcut to the next level. It's been a long time since I played Rogue, and experimenting with Talisman brought back a lot of memories that had been softened by other roguelikes. NetHack is a breeze compared to Rogue. Since enemies reliably drop items in NetHack (but not Rogue), you can farm early levels as long as you want. Food is everywhere. Rogue--and Talisman--are much more unforgiving. Enemies respawn, but they almost never carry anything. You can't eat corpses, and there are no instrinsics. Every action you take burns more calories, and you're constantly praying to find food before the "Hungry" alert shows up in the status bar. Inventory is much more limited, and there are fewer tricks to get out of sticky situations. There's gold--which contributes to the final score--but no shops. There are no fountains, no wishes, no altars, no blessings, and no luck statistic. The most prized item in the game. And yet, overall, I didn't have too difficult a time with the game--certainly nothing like my Rogue experience--and I wonder if Talisman wasn't programmed to be a bit easier. There's nothing obvious, but I suspect food lasts slightly longer, and the numbers are slightly more generous with player attacks and damage. I could be wrong. But while I didn't even try to play with permadeath--I allowed myself to copy the save every 2 levels--I still only had to reload about six times. And I wasn't that careful in my explorations. A rare death, which looks like the original Rogue death screen. The game is pretty easy through about Level 10. If you're lucky, you can trade out your starting mace and ring mail for some of the higher weapons and armor (e.g., two-handed sword and platemail) on an early level. That way, any scrolls of "Armor Enhancement" or "Weapon Enhancement" that you find will stack on the same equipment throughout the game. Also prized are potions of "Gain Strength," which add to your only real attribute. Perhaps the most useful offensive magic item in the game is the Wand of Cancellation, which removes a monster's special abilities. The worst enemy on early levels is the giant ant, whose venom can remove a point of strength. Later on, you have to worry about rust monsters--although if you're careful and see them a couple squares away, you can doff your armor. Wraiths, which drain levels, start appearing around Level 15. On lower levels, the toughest regular foes are umber hulks and xorns, both of which pound away dozens of hit points per attack. Vampires also do a lot of damage and can drain your maximum hit points. Once you hit dungeon Level 20 and character Level 10, a smart player treats it more like a stealth game, avoiding combat when possible and taking the stairs the moment he finds them. If he's lucky, he has a Ring of Slow Digestion and a Ring of Stealth by this point. A late-game inventory. The teleportation items are useful to get out of tight situations. The game's version of the Amulet of Yendor is the Talisman of the Ancients, found in a random room on Level 26 (or perhaps starting on Level 26; I didn't go down further). There's no Wizard of Yendor or other special challenge before walking up and taking the Talisman. There's not even any magic in the game. So that's why the game is named Talisman. After you find the Talisman, the stairways reverse and the challenge is to fight your way up. Of course, you take the stairways the moment you find them, and always revel when the next stairway is in the starting room. Unlike NetHack, the game doesn't remember earlier levels and regenerates new ones as you go up. But also unlike NetHack, it preserves the original levels' difficulty levels. So while you can't get too cocky, by the time you get to Level 15 or so, there's not much danger. At that point, the game becomes mostly an annoyance when a trap knocks you back down a level, or when you can't find the stairs because you need to find a secret door first. It's a relief when the stairway appears on Level 1 and you ascend for the last time. Talisman offers a better winning screen than Rogue, hinting at a slightly deeper story, but that's about it. At least after all that work, my reward isn't that I get to join a guild. 1 points for the game world. Lacking an introduction, we only hear about the nature of the quest at the very end. 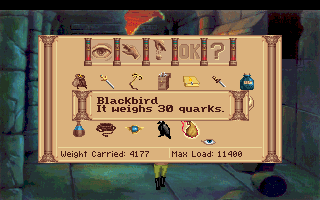 I can only assume the original distribution came with a text file or something that set up the quest, but I have to rate what I experienced. 2 points for character creation and development. With no creation, no races, no classes, the only points I can give it are for the strength and level increases, which are rewarding when they happen. One of two primary means of "character development." 2 points for encounters and foes. While the menagerie is small, it has some nice variances in strengths and weaknesses, and the traps provide an additional challenge. 3 points for magic and combat. Like most roguelikes, combat seems pretty basic, but it can be quite tactical when you consider terrain and the use of missile weapons and special objects. Fighting one of the game's more difficult foes. 5 points for equipment, almost always the strongest category in roguelikes. This little game offers more variety in weapons, armor, rings, potions, wands, and other items than most AAA commercial games of the era, with the need for identification offering an additional puzzle. 1 point for economy, which just serves to increase your final score. 2 points for a main quest with no side quests or options. 2 points for graphics, sound, and interface for serviceable graphics and very intuitive commands--except for movement. 3 points for gameplay, earned for offering the right challenge level (for a roguelike) and a modest play time. I'm somewhat sick of roguelikes that think that if the original's 25 levels was good, 50 must be twice as good. That gives us a final score of 21, which lands where I expected it to in relation to the original Rogue's 24. In the end, we can say that it's a decent piece of programming that faithfully replicates the original Rogue on the Atari 800, but doesn't accomplish more than that. Talisman is so obscure that Rogue Basin doesn't even have it, and I can barely find any mention of it online. K. Newman is also a pretty obscure figure. His name appears on a handful of Atari 800 games in the late 1980s, none of the rest of them RPGs. At least that one was quick. We're only two games away from the end of 1988 (again), but one of them is French, so . . . you know . . . it might take a little while. Or just one if you're a grammar nazi. Sometimes, when a commenter tells me about a game not on my list, I can pretend I didn't see the comment, and I therefore don't have to add it unless they get really insistent about it. But when a commenter says that I've missed about 20 games, all from the same publisher, as JarlFrank recently did, I can't just ignore it. The company is the still-extant Motelsoft of Stuttgart, Germany, and the first of its RPG titles is the unfortunately-named Seven Horror's. It is called Seven Little Horrors on the publisher's site, but it drops the "Little" (and adds an unnecessary apostrophe) on its title screen. Unfortunately, I haven't been able to find any documentation for the game, but the backstory summarized in a magazine indicates that the land is called Timor, evil threatens, and it's up to the party to find seven artifacts and a mysterious key, then confront the purveyor of evil in the Black City. The Black City explains what I need to enter. The twist (and the magazine article doesn't explain this) is that the party is composed of monsters, and if Seven Horror's does one thing well, it's introducing a variety of bizarre character and enemy portraits. Nice of Motelsoft to preload the scoreboard. The game begins with a roster of 10 characters, from which you select 3 to go adventuring. (I don't know if the default roster came with the game or if it's just what's saved on this particular disk image.) You can delete existing characters to create your own. Races, I'm guessing, were mostly made up by authors of the game rather than reflections of German high fantasy. They are Orge, Thauma, Hunch, Waxor, Gnome, and Megrim. "Orge" is probably a misspelling of "Ogre," "Thauma" perhaps a back-formation from "Thaumaturge" (Thauma itself meaning "miracle" in the original Greek). No idea on "Hunch" or "Waxor." "Gnome" is the only thing recognizable from normal fantasy. "Megrim" means a kind of funk or depression in English, so I have no idea how it translated to a race in a German game. Gathering a party of my own creation: an Orge magician, a Gnome vampire, and a Thauma devil. Classes are less bizarre: magician, banshee, devil, vampire, voodooca, and psychic. Each race/class combination gets scores in "vitality" (basically strength, or the damage they do to enemies) and hit points as well as starting values in each of the game's six magic powers, which are the same as the classes (roughly: devils use the "hell" magic power). Magicians naturally start with the most points in magician magic, but they also have some values in psychic, vampire, devil, and voodooca magic. My Thauma devil started with at least some points in all magic. The game begins on a small overland map dotted with towns and dungeons. It's impossible to distinguish them, so I made some annotations. There are 4 towns, each of which offers a single service: one town to heal, one to save the game, one to level-up, one to swap out characters for others on the roster. The healing town is called "Sandor," which is the name of the next two RPGs from this developer. My annotations of the game map. There are 14 dungeons, 10 of them displaying a level from 1-10 before you enter. This is presumably to help guide the explorations and prevent inexperienced parties from tackling the toughest dungeons. Combat comes randomly as you explore, always against individual enemies. It took some getting used to. When it begins, the third character always activates by default, but you can activate the other two by clicking on the "rollers" under their portraits. You can switch characters throughout combat, but you only get one attack per round no matter who makes it. 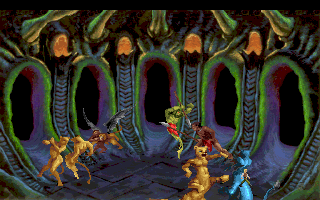 Combat begins with one of the game's inventive enemies. Attacking is all done by magic. Every foe is susceptible to one of the six types of magic, so you have to do a little experimentation the first time you encounter an enemy (and the game doesn't have very many of them), but after that it's just a matter of consulting your notes. Using a type of magic drains your points in that magic type, but you can still use the magic even if you have 0 points. You do a lot less damage than if you have points, but the foes' vulnerabilities are so imbalanced that it's better to attack with 0 points using the right skill than with many points in the wrong one. I'm not sure if the character race or class makes any difference beyond the starting vitality and magic points. Babayaga tries an ineffective attack. An effective one does like 100 points instead of 2. The character who scores the kill gets most of the experience from the combat, while others get 100 experience points for combats in which they didn't participate. The party also gets gold from the encounters, and the amounts are laughably variable. One might deliver 34 gold pieces while the next provides 25,089. Alas, there's no town that restores magic points. To do that, you have to enter the dungeons. The dungeons are all one level, 29 x 19. The numbered dungeons offer an automap and use the "worm tunnel" convention by which there's always wall space around corridors, and every potential space is filled. Every wall has some kind of monster portrait on it, and a lot of them have buttons underneath that open doors. There are occasional spinners and teleporters. Combats are about as frequent as in the outdoor areas. Slowly filling in the automap. There's a treasure in the lower-left corner. As you explore, you periodically come across containers in the lower-left corner. Opening them may provide you with healing or a boost in a particular magic score. The game lets you check your current levels before deciding who to apply the increase to. Combats only get more difficult, and longer, the higher the dungeon level that you explore. I soon discovered a few important tips. First, the damage you do is based on both your vitality and your current point level with the associated magic type. The spell points aren't just a reservoir of power; they also indicate a current skill level. Thus, it makes sense to give point boosts in a particular category to a single character, getting his skills as high as possible, rather than spread them out evenly. It makes sense for each character to specialize in two magic skills. Second, combats in the dungeon eventually get so long and deadly that it makes sense to flee from most of them and do your grinding later, in the outdoors, where you have easy access to the healing town. A mid-game combat. Note that my third character is specializing in magician and banshee magic. When the treasure canisters don't provide skill boosts, they provide one of the game's 20 inventory items, or I guess potions, which you can use as-needed. These various items heal individual (or all) characters, resurrect, provide boosts to vitality and experience, and increase points in the different magic skills for everybody at once. A couple are mysteries. For instance, one says that when used, feinde sterben, which means "enemies die." But you can't use the items in combat, so I'm not sure how that works. Another is labeled "Protons I" and simply lists "?????" for the description. My inventory items after finding one artifact. The spaces at the top of the inventory screen are reserved for the 7 artifacts. I found the first in Kalos, the "Level 1" dungeon, then slowly assembled the remaining ones from among the other 9 leveled dungeons. I have no idea what any of them are depicting. Three of the numbered dungeons, of course, have no artifacts. The four unnumbered dungeons are a bit odd. They have no enemies within them and hardly any walls. Instead, they have about half a dozen squares that offer copious treasure--and one square where you encounter a mage who wants that treasure in exchange for a hint. "The miserable creature cannot be defeated without the magic word," the magician told me in the first of these dungeons that I explored. The other three offered single words--"XORA," "NADA," and "LOR"--which perhaps together equal the magic word. This gives me a lot of gold, but what is it? A cash register? An ornate treasure chest? I said "a mage," but honestly, I have no idea what this guy is. Leveling up, which only increases your maximum hit points, takes a long time. In eight hours, I was only able to get to Level 3. It's going to be a long time between levels. After eight hours, I've explored every dungeon and found the seven artifacts, but I have no idea how to find the schlüssel I need to enter the Black City. Dungeon exploration isn't exciting enough for me to go through them all again, and I think I was pretty thorough the first time anyway. Thus, I'm going to prematurely offer a GIMLET for what I experienced but hold the game open a few days in hopes that someone comes along and offers a hint. I'd also like to know more about the backstory. Are my characters evil? Or is the game inverting usual tropes and suggesting that vampires and devils can be heroes? 2 points for the game world, maybe more if someone can show that the documentation provided a more interesting backstory. As it is, a land of monsters is pretty interesting on its own. 2 points for character creation and development. The races and classes don't seem to mean much since anyone can use and develop in any type of magic. Leveling is too rare to be very rewarding. 2 points for encounters and foes. Once you learn their weaknesses, there's not much to the enemies. 2 points for magic and combat, which are identical. Again, there aren't many choices to make during combat itself. 2 points for equipment, a small but useful set of enhancements. 2 points for economy, which almost all goes to healing. It would have been cool if one of the towns had a shop to buy the various potions or other magical enhancements. 2 points for its fun, bizarre graphics, but none for its sparse sound and annoying, mouse-only interface. 3 points for gameplay, mostly for what seems like a modest length and a decent challenge. That gives us a preliminary final score of 19, but I'll hold out the possibility of amending it if I'm ever able to continue and win. According to Motelsoft's web site, Seven Horror's was based on an earlier Atari 8-bit game called Labyrinth (1986), which no longer exists. Neither game seems to have attracted much notice or press, but that didn't slow them down. 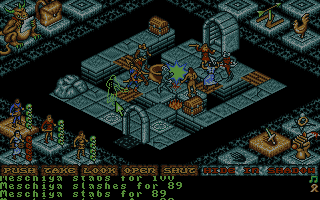 We'll soon encounter them again with Sandor (1989) and Sandor II (1991), top-down games with first-person dungeon exploration and tactical combat on a grid; there seems to be some Ultima inspiration here. The company offered 20 more RPGs through 2006, ending with Arcan - Der Schatz des Hexenmeisters. With an eye towards finishing 1988, we move now to a Rogue clone called Talisman. I really struggled over whether to quit this one. On the one hand, it was getting a little better. On the other, it was simply exhausting. Combats in Kilijan's Dark Tower became difficult enough that each one was a nail-biting fight to the death, requiring all my best tactics and spells, and even then I had to reload half of them. Most RPGs give you maybe 10 throw-away battles punctuated by the occasional significant battle. In Legend, none of the battles are throw-aways. A random encounter in a corridor you just cleared can absolutely destroy you, with enemies pouring in from all sides, a new one arriving to replace every one you've slain. I swear, some battles go on long enough that the game decides to generate a new random battle while you're still fighting the old one. My inventory got so overloaded during the third level of the Dark Tower that I decided to make the journey back to the main map, with all of the random combats in between, to sell the excess goods, donate money at temples to restore luck, and level up. I did all of these things, then couldn't force myself to re-enter the tower and wind all the way back up. I sat on it for a couple of days. Finally, I decided I'd quit if someone else online had documented the endgame. As far as I made it: the stairs going up to Level 4 of the Dark Tower. The Dark Tower turns out to be five levels. 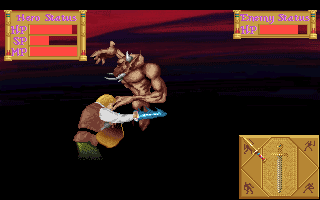 At the top, the player defeats Kilijan (who is immune to "Disrupt" and "Paralyze") and gets his magic staff, either keeping it or turning it in to the Ancient for a reward. Somewhere in the Dark Tower, the player finds a skull key that opens up Levels 3 and 4 of Fagranc. Once you clear those, you have to visit taverns to hear of the discovery of a "power gem" in the sewers of Balenhalm by some "ratmen." Balenhalm is a single large level. Next up are two levels of Moonhenge in the northeast corner of the map. It provides the keys necessary to explore Levels 5 and 6 of Fagranc, which in turn provides the items necessary for the two levels of the Unshrine (which jumps around the map), where the party contends with Tetrahagael, the Chaos Lord. This is apparently an exceedingly difficult battle, as the Chaos Lord has magical protections (which you have to dispel), immunities, and very high hit point total. The Chaos Lord has the key necessary for the eighth and final level of Fagranc. While exploring the dungeons, the party members also find the titular four crystals of Trazere, each of which boosts the defenses of one of the towers on the overland map. Between dungeons, the party has to reconquer cities seized by the enemy and provide gold to boost staffing at the towers. This is the kind of statement that would make a robot's brain explode on the original Star Trek. After delivering the fourth crystal, the party discovers that King Necrix himself is responsible for the evil taking hold in the land. ("Necrix" always sounded like a suspicious name.) The party must assault the king's fortress, fight up three levels, and slay him at the top. It took Dzyu over half a dozen attempts. Watching this part of the video gives you a sense of the complete chaos that is combat in this game. Even watching instead of playing, I can't tell what's happening most of the time. Spells are exploding all over the place, characters die in seconds. It's so crazy that in the fight where he finally kills the king, he doesn't even realize it for a few seconds. A typical shot from the final battle. Even after killing the king, Dzyu has enough trouble with the chaos beasts that he runs into an adjacent room hoping for better terrain, and in the midst of combat accidentally reads a sign--and unwittingly concludes the game. (To his credit, he recorded a final video in which he completed the combat before reading the sign.) He's clearly let down by the lack of denouement after so many hours ("I think I would have preferred at least some artwork"), but he remarks that he should have expected it given the sparsity of story throughout the game. 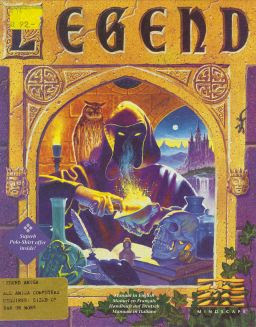 The sign, of course, confirms Legend as a prequel to Bloodwych, the idea being that the Bloodwych now take over in the place of Necrix, reign peacefully for a while, and are then usurped by Zendick in the first game. 1. "Missile-Disrupt-Disrupt-Disrupt-Damage-Damage-Damage." An all-purpose "blast the hell out of a targeted enemy" spell. "Disrupt" is more powerful than "Damage" but some enemies are immune to it, so I'm sure the goal here was to have a spell that would devastate anyone. 2. "Surround-Damage-Damage-Damage-Missile-Damage-Damage-Damage-Surround-Damage-Damage-Damage-Missile-Damage-Damage-Damage." This one is similar to my "fill the room with fire" spell, but jacked up to the maximum possibility. 3. "Heal-Heal-Heal-Continuous-Heal-Heal-Heal." The best I can figure, this immediately triple-heals the caster, then creates a square of healing magic in the room that other characters can walk or teleport into. 4. "Missile-Surround-Vivify-Heal-Heal." This allows the caster to resurrect any dead characters in a 9-square radius and then immediately heal them a bit. 5. "Regenerate." His only single-rune spell lets the caster regenerate quickly. 6. "Missile-Teleport-Speed." Allows the caster to send one of his colleagues to another place in the room and simultaneously give him extra attacks. 7. "Teleport-Regenerate-Speed-Antimagic-Surround-Teleport-Regenerate-Speed-Mystic Weapon-Antimagic." A kind of holistic pre-combat spell that gives each character the most important buffs and allows him to place himself anywhere in the room at the beginning of combat. 8. "Missile-Forward-Missile-Teleport." No idea. I'm guessing this was a solution to his last puzzle somehow. He doesn't have any of these mixed, which bolsters my hypothesis. 9 & 10. "Missile-Paralyze" and "Missile-Dispel." Both quick spells to affect a single target. Analyzing some of the videos, "Teleport" is the real workhorse, and it makes sense that "Cloud" objects (rings, potions, wands, helms), which cast the spell, are vital to the party's success. They're the key to placing characters in strategic positions at the outset of combat, and to ensuring that the assassin is well-placed to use his backstabbing abilities. The spell also gets wounded characters out of combat and to healing squares. My GIMLET combines both my experiences and what I observed in Dzyu's videos. 1. Game World. Neither the game world nor the story is well fleshed out, consisting primarily of allusions rather than real descriptions and sensible bits of lore. The game's "twist"--Necrix being the evil lord behind the invasion--doesn't really make any sense. Why didn't he undermine the "good" armies? Why did he send the party to Fagranc? It's too bad, because the connections to Bloodwych would be more meaningful if the story in either game made more sense. Score: 3. 2. Character Creation and Development. There are limited options during creation, and I feel that the number of levels achievable during the game (about 12) is a little low given the difficulty of combats. You have no choices while leveling up--you just get a random selection of stat upgrades. On the plus side, each of the four characters plays a pretty stark role. You can't just treat them all like fighters. You have to carefully equip and position them in ways that call on the strengths of their classes. I also like that the four classes--berserker, troubadour, assassin, and runemaster--are just a bit different than the standard fantasy RPG roster. Score: 4. A late-game troubadour, from Dzyu's LP. 3. NPC Interaction. I'll give a point for a few people in the various towns, but really those are more part of the "encounters" or "economy" than true NPCs. Score: 1. 4. Encounters and Foes. As a somewhat non-visual person, it particularly annoys me when games don't name their monsters or use color to distinguish types or difficulty, and this game does both. The monsters in the game are a varied selection of humanoids and beasts, some of which do physical damage only, some of which are capable of magic, some of which have magical immunities and protections. I suspect it becomes important to note which is which, and I don't like having to fill notebooks with things like "bluish guy that looks like a minotaur--can self-teleport." The other aspect to "encounters" is the puzzles. I ran hot and cold, as I do with almost any game that features these sorts of mechanical puzzles (cf. DarkSpyre, Chaos Strikes Back). I thought some were too difficult and others offered the right level of challenge. They seem to get pretty crazy towards the endgame. Score: 4, but those who like puzzle-oriented games might boost this to a 6 or 7. 5. Magic and Combat. The magic system is obviously the highlight of the game, offering potentially thousands of creative combinations. I would love to have this type of spell system, maybe with a few more effects, coupled with a proper tactical combat system--either turn-based like the Gold Box games, or real-time-with-pause, like the Infinity Engine games. The combat system actually offered in Legend has too few tactical options for non-spellcasters, is too chaotic and confusing, in too tightly-confined territories, with poor pathfinding and AI. It undermines most of the positives of the magic system. Score: 5. 6. Equipment. A positive that I probably didn't focus enough time on. Each character gets a variety of weapons, shields, armor, helms, gloves, boots, amulets, rings, wands, potions, and special items like the troubadour's various instruments. Upgrades are fairly regular. For regular weapons and armor, you can easily see their effects on your various statistics. For magic items, you have to experiment and study the effects (or take them to the Ancient for identification), but the totality of the items allows all characters to wield some magic and thus increases combat tactics. I also like that the available items in shops changed throughout the game, and that the treasures were randomized rather than fixed. Score: 6. 7. Economy. Another strong point. Between equipment, leveling, runes, reagents, donating at temples for "luck," and fortifying towers, money remains relevant until the end of the game. Score: 6. 8. Quests. There's a main quest with multiple stages, but I don't think there are "side quests." One of the stages, at least, gives you a single choice, but in general you're on a linear rail throughout the game. Score: 3. You have to love "I shall kill you all myself . . . Guards!" 9. Graphics, Sound, and Interface. I rather like the oblique-angle graphics and the various dungeon scenes they create, and I didn't have any problems with the interface, which offers redundant mouse and keyboard options--with the exception of targeting (sometimes). Sound, on the other hand, is only serviceable, consisting of the "ding-ding-ding" of weapons while the same troubadour tune drones endlessly in the background. Score: 4. 10. Gameplay. Here's where it all falls apart by hitting every element of the Unholy Quartet: too linear, too hard, not replayable, and above all, too long. I'll give a point in this category in recognition of the outdoor map, which allows relatively free exploration between the dungeons. Score: 1. That gives us a final score of 37, just above my "recommend to check out" threshold, but not quite all the way to "good." Anthony Taglione, responsible for both this and Bloodwych, is clearly a talented programmer with some good ideas. Both games started with a popular base (Dungeon Master in the case of Bloodwych) but brought their own innovations. Neither Bloodwych's cooperative multiplayer nor Legend's magic system have anything quite like it among their predecessors. But both games commit the fatal sin of not knowing when to quit. Neither 1989 nor 1992 was ready for 100-hour games; the hardware and software of the time simply didn't support enough content. Even today, I regard a game that requires 100 hours with a jaundiced eye, although I have no trouble with games that allow for that length. I trust you can see the difference. Of course, even given any memory- and space-based limitations, this small series is still pretty paltry when it comes to actual story. And both games reward dozens of hours of gameplay with a single screen of text at the endgame. I would have shared Mr. Dzyu's expectation for at least some artwork, particularly since Legend featured an animated introduction. Computer Gaming World overlooked this one, but Dragon got to it and gave them an uncharacteristically-low 3/5 stars, calling it a "decent effort" with an original magic system but "limited character creation," confusing combat, and an unintuitive interface. European reviews mostly ran in the 80s and 90s (though the German Play Time gave it a 56). Unfortunately, I can't quote any of them because the site I use to find full-text magazines from the period is down. Given the light standards of journalistic integrity that we've seen in most European Amiga magazines, it's hard to imagine that many (if any) of them made it to the end before reviewing the game, and I feel that the interminable length and abrupt conclusion are key parts of the game. We aren't done with the world of Trazere. 1993 will bring Worlds of Legend: Son of the Empire. Judging by the screenshots and game description, it is simply Legend with different maps, featuring a quasi-East Asian theme. In 1994, we'll face Hexx: Heresy of the Wizard, which appears to be an updated variant of Bloodwych. Those will be our last experiences with Mr. Taglione, as the other offerings from both him and co-designer Peter Owen-James are action and adventure titles (1993's Bram Stoker's Dracula, 1997's Alpha Storm). We'll clean up a couple of 1988 offerings before getting to the next 1992 game, starting (maybe) with Seven Little Horrors, a bizarre German game from Motelsoft. I'm having trouble with the interface and have written to the publisher for help. If I can't figure it out in time for an entry, we'll move on to the easy-but-bland Talisman, a roguelike for the Atari 800. I was really looking forward to trying the first version of the long-running UnReal World. Released in 1992, version 1.00b is completely unrecognizable to a player of later versions, with a vastly different interface, different rules, and a high-fantasy setting (rather than real-world Finland). But I can't get it to run. I can run the character creation program and the world setup program, but the main program offers four options, each tied to a function key, and none of them activate. I've verified that the function keys work in DOSBox with other programs. If I can't get 1.00b to run, I have to wait until 1994 for the next major release. Note that the box character is explicitly the paladin. Even if originally unplanned and somewhat interpolated between Trial by Fire and Shadows of Darkness, Wages of War is a worthy game that continues the series' admirable efforts to walk the line between heroic epic and whimsical fantasy. As I did with the previous games, I had a lot of fun playing it, as evidenced by my insistence on going through it 5 times. However, I must conclude that while (to my limited perspective) it performs just as well as its predecessors as an adventure game, it does slightly less well as an RPG. I think this is less because of the game's approach and more because of the issue that a lot of games experience in which character development is less palpable the further the character gets from his starting skills. Here, any character who built his attributes and skills to near-200 in Trial by Fire can coast through the game, winning every combat and passing nearly every skill check without having to put in any effort. The only exceptions I can think of are "Throwing" and the "Agility" attribute, both of which must be developed to the mid-200s to win the warrior initiation rituals. As for spells, the game seems to have completely forgotten the skill level attached to them. I guess "Flame Dart" and "Force Bolt" did more damage as my skill went up, but there was no threshold attached to successful uses of "Juggling Lights," "Fetch," "Reversal," "Open," "Trigger," or any of the puzzle-based spells. This was also true of a few non-spell skills like "Climbing" and "Pick Locks." It's important that the series not abandon skill checks because what makes the games such good hybrids is that knowing the solution to the puzzle isn't enough: you also have to have developed the skill to a high enough level to use it successfully. My fighter was the only character to face a true challenge, starting with statistics lower than a veteran character coming from Trial by Fire. This allowed me to experience the changes in the combat system in a way that I couldn't with the previous characters. I think Wages of War's combat mechanics are the best of the series so far: It's clearer when you need to dodge or parry, and you can't just spam attacks. Moreover, the wizard is effective enough (and has enough mana points) that he can survive in combat entirely as a spellcaster. Enemy movements help determine the best times to slash or thrust. The poor thief limps into Shadows of Darkness having enjoyed no place to practice his skills. There are only two locks to pick (and the nose trick no longer works). There are a couple of places to climb, and one (the Anubis statue at the end) that you can climb repeatedly, but none of them seemed to increase the skill. Finally, I'll note that achieving a perfect score is much more of an achievement here than in previous games. A lot depends on luck, and it's easy not to realize that you've missed a potential encounter. For instance, if you encounter Harami in the bazaar during the day and agree to meet him at night, you get 4 points. But if you encounter him first at night, you can progress with his side-quest, and yet you miss the 4 points. Several points are dependent upon temporary dialogue options. For instance, you get 2 points for telling Kreesha about the leopard woman after you dispel her but before you marry her. So if you don't trek back to Tarna between dispelling Johari and marrying Johari, you can't get those 2 points. Similarly, you get 2 points by talking to Uhura about marriage after marrying Johari but before giving her any gifts. 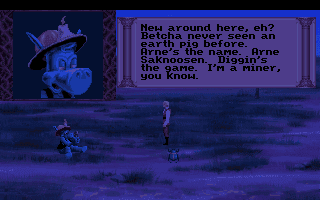 Other points depend on selecting the "correct" dialogue option while meeting with Rajah or the Laibon. If you try to cover everything, you may miss out on the point-giving option when he gets tired and kicks you out. Finally, I think some of the points are just bugged. The walkthroughs I consulted say you get 3 for reading the bulletin board in the tavern, but I just tested it and got none. I also don't think my paladin got the points he was supposed to get for defeating the Demon Worm towards the end, nor defeating an ape man for the first time. Since points don't affect the character's skill or power, it's easy to say that it's no big deal if you leave this game having missed 25 or 30 of them. On the other hand, points are important because they're the only way to tell that a player has experienced most of the game's content. As we saw with my "Bad Chester" experience, many of the actions and moments in Wages of War have no practical value in terms of the direction of the story. Giving gifts to Johari, helping Harami, participating in the Sekhmet ritual, playing the mini-games in the Simbani village, and most NPC encounters and dialogue options are reflected only in points. It's too bad they're not more practical. It would be cool if the number of points earned in each game was translated to a bonus pool of skill points that you could allocate at the beginning of the next game. I expect Quest for Glory III to rate about even with II, which was a bit lower than the first one. I think the lesser RPG elements will be balanced by higher scores in game world and combat. Let's see. Tarna as a city and a land is an absolute joy to behold. Wages of War’s African-inspired setting was unique at the time, and remains so to this day. It’s an underused milieu, as evidenced by the popularity and aesthetic impact of Marvel’s recent smash Black Panther movie. Audiences, whether in movies or games, like to see things that they have not seen before, and Wages of War delivers. But I also agree with Alex that the story is a bit weaker. Everyone is too-easily manipulated by the demons, whose overall plan really isn't that clever or original. Still, this doesn't detract too much. In general, Wages of War offers almost everything I'm looking for in this category. Score: 8. I didn't talk about it much while playing, but the documentation perfectly complements the game setting. At the same time, so much exposition is delivered in-game that the documentation is almost optional. 2. Character Creation and Development. I continue to admire Quest for Glory's skill system, and the satisfying way that attributes and skills increase as you use them. Some of them are delightfully unintuitive, such as the way intelligence increases when you perfectly-time a dodge or parry. (I still have no idea what "Luck" does or how it goes up.) The increases are regular and rapid enough to be satisfying, but you still have to grind (which isn't necessary) if you want to reach the end with perfect scores. Perhaps most important, the series is a rarity in offering tangibly different experiences for different classes, to the extent that I had to replay it several times to see all the content. The differences among classes seem to grow more stark with every new game in the series. In So You Want to Be a Hero, the differences amounted to a couple of side-puzzles (that anyone could engage in if they had the skills). In Trial by Fire, each class had a side quest but mostly followed the same path. In Wages of War, class choice makes fairly significant changes to the story. My primary quibble in this category is what I discussed above: the lack of necessity of character development, particularly if you import a character from Trial by Fire. And in some ways, the series seems to be losing its grip on the importance of skill level to success. Score: 6. 3. NPC Interaction. As usual, we have a great cast of characters here with individual personalities and interesting back stories. More so than the previous games, each character has different dialogue "trees" for different points in the game, so it's very easy to reach the end without having spoken to everyone about everything. The need to click on yourself to explore various "Tell" options was disconcerting at first, but it ultimately added to role-playing, as did the time limits imposed by certain conversations. I have to tell you, though: I miss the need to take notes and type the dialogue options. All the clicking made it too easy to go too fast and overlook key bits of information. Score: 7. Even this guy had a whole dialogue tree. 4. Encounters and Foes. I found the enemies less imaginative in this entry. Almost all of them could have come from Dungeons and Dragons but with different names. (In particular, why name a charging lizard-beast something as bland as "dinosaur"?) The puzzles were a bit too easy, as usual, and mostly involved having the right item rather than doing the right thing. However, there were occasional multi-stage puzzles that offered a satisfying challenge, including the thief missions, the wizards' duel, and the endgame sequence. Score: 5. 5. Magic and Combat. Slightly improved. The combat control panel is easy to master, whether you're just fighting or switching between physical attacks and spells. It's clearer when you should time dodging, parrying, and attacking, although the monsters aren't hard enough for it to really matter. The wizard can engage in combat solely as a wizard, and spells like "Calm" and "Dazzle" do what they're supposed to do pre-combat. I like that good throwers can take down enemies with daggers and stones. But the system remains mostly optional, with too little in the way of tactics, for a very high score. Score: 4. 6. Equipment. Pretty weak on the RPG side. The paladin gets a weapon upgrade, and the fighter can if he becomes a paladin. Other than that, weapons and armor remain what you started with. Almost everything else is a puzzle item except for the pills. Score: 2. Does anyone know why my thief carried this thing around for the entire game? 7. Economy. Unfortunately, quite bad. Some easy improvements in this area would have affected the whole game. The problem is that you start with as much money as you need to get through the entire game. This leaves no incentive to fight for gold, for the thief to steal the chests in the two huts, or even to engage in the "bargaining" mechanic. It also encourages you to make a single trip through the bazaar and buy everything at once instead of prioritizing--and returning now and then to get new dialogue options with the NPCs. When the economy is too generous, there is basically no economy at all. Score: 1. 8. Quests. There's a solid main quest and several character-based side quests reflected in points rather than story outcomes. As I covered in my experience with "Bad Chester," I was disappointed that so few of the options really mattered in the endgame. I feel like a few tweaks could have made this better: if you didn't give the gifts to Johari, or help Harami, or free Manu from the cage, or even meet Yesufu, they simply don't show up. The player then has to overcome more enemies than if he had his full contingent of sidekicks, and may fail if he doesn't have enough pills. (This approach would have made the economy more relevant, too.) This also would have forced the player to pay more attention to Sekhmet's prophecy and fulfill its various clauses. Ah, well. Score: 4. I don't think I previously offered this cool shot of all my companions fighting their doppelgangers. 9. Graphics, Sound, and Interface. The VGA graphics are really the best we can expect with the technology of the era. They look beautiful and evocative, and they make great use of the setting and theme. I particularly love the way the overland map is framed as if you're looking from high atop a southern mountain, with trees in your immediate periphery. 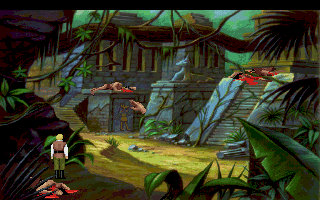 I like this shot of the Lost City with my thief surrounded by corpses of ape men. He had to kill one every time he came down from the Anubis statue, and he was trying to build his "Climbing" skill. Sound effects were fine. The disagreements that I have with most players about music are only going to get more hostile as the quality of music compositions increases over the years. As I've noted repeatedly, while I can appreciate the effort that went into the game's score, I still don't want to hear it all the time. This is true in other aspects of life, too. Take any of my favorite songs--Louis Armstrong's "Potato Head Blues," Louis Prima's "Just a Gigolo," Sarah Vaughn singing "For All We Know"--and put them on in the background while I'm trying to concentrate on something else, and I'll ask you to turn them off. To me, background music is like a background television show or a background movie: it distracts from, rather than adding to, the foreground. This is why my GIMLET doesn't include music in this category. Taken by itself, the music here (credited to Rudy Helm) is superbly composed. It's approached as a true score rather than just a bunch of individual melodies, which means the same motifs are used across multiple songs, but with different tempos, harmonies, and keys to represent different settings. Alex linked to a YouTube video containing the full-length versions of all of the game's songs, and the entire "album" clocks in at 90 minutes. Several compositions follow classic sonata-allegro form and others seem inspired by Debussy's orchestral impressionism. I turned it all off while I was playing. You know what I preferred to continual background music? When I walked up to Baba Yaga's hut in Hero's Quest and there was like a six-second leitmotif and then it stopped. So I apologize to composers and video game music lovers everywhere, but this is going to be a constant issue and there's no point getting on my case about it with every game. I preferred the text parser to the point-and-click interface, although I admit that the latter has uses for targeting. I remain impressed with how many individual screen objects had a "look" description attached to them; I couldn't have clicked on more than 25%. But I had all kinds of other problems with the interface, including an "Action/Special Items" menu that refused to stay active, an inability to coax my character off the edge of the screen, and crashes to the desktop every half hour or so. I realize that some of these are likely to be emulator issues, but I have to rate what I experienced. Score: 4. 10. Gameplay. I'm sure I said the same things about the previous two games: a little too linear, a little too easy, and a little too short--but only a little. The series continues to get major points for "replayability." Score: 5. The ad emphasizes the right sentiment, but boy does it use the wrong screen shots. The Adventure Gamer's score came in the other day at 68, which was two points higher than Trial by Fire and the same as the original Hero's Quest. (And keep in mind that they're more generous overall.) This bolsters my opinion that it's equal to its predecessors as an adventure game. I guess my own GIMLET contributes to the idea that Wages of War is the least of the series (assuming that I rate the next two games higher), but I still think Matt Barton goes too far in Dungeons and Desktops when he says that "most fans of the series regard it as pedestrian at best." I would think that most fans, like me, would regard even the least Quest for Glory better than the average game of the time. Contemporary reviews don't offer any suggestion that the series has dipped. 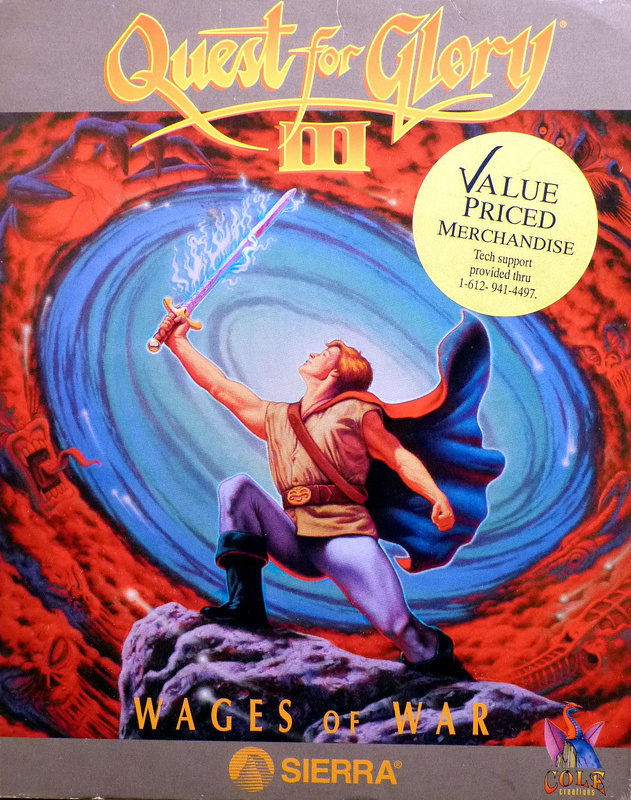 Jeff James's review in the January 1993 Computer Gaming World is unabashedly positive, lauding the "exotic new landscape" of Fricana, the "sumptuous hand-painted graphics," and the soundtrack. The only "blemishes" he found were a few bugs and the frequency of enemy encounters. (Alex mentions the latter, too. I didn't find the frequency to be so much overly-frequently as bafflingly variable. Sometimes I'd cross an entire screen of savanna with no encounters, and other times I couldn't walk more than an inch between them.) In his conclusion, James explicitly calls Wages of War the best in the series so far. This is echoed in the April 1993 Dragon, which starts out by saying, "This is by far the finest of the Quest for Glory adventures." In a time too far ahead to try to estimate, I'll determine if I agree or disagree with the other common assertion that fans find Shadows of Darkness (1993) the best in the series. I don't know how much longer I'll be doing this, but I can guarantee I won't stop before then.